With keynote talks by Nishat Awan (Goldsmiths University of London) and Professor Doina Petrescu (Atelier d’Architecture Autogérée and University of Sheffield), this Newton funded symposium will explore methodologies for the spatial mapping of social value, for example connection, community, memory, identity and empowerment. Contributions are invited from researchers both practitioner and academic with an interest in making social impact more visible and therefore more valuable. Maps are often thought to be benign and neutral representations of the world. But as James Corner observes through the ‘selection, omission, isolation, distance and codification’ of maps, they have the capacity to be, ‘strategic, constitutive and inventive’. Moves towards open and freely available mapping, such as Open Street Map and Google Earth, alongside advances in technology, mean that more and more people carry maps in their pocket as they go about their daily activities in the city. Previously, high resolution satellite imagery and geolocating technology would have been the preserve of the military, however, today it is ubiquitous. With the rise of smart phones and sensors people can easily gather, produce and navigate city data. This raises questions, not only with regard to what mapping can reveal about the city, but also about what remains hidden. In order to explore sociocultural concerns in context, mapping may provide visual and/or participatory ways of exploring alternate perspectives. By taking into consideration the stories behind these maps, previously unrecorded narratives can richly complement our understandings of where and how we live. To encourage debate, intimacy and networking across disciplines and sectors numbers will be restricted. There will be no registration fee. 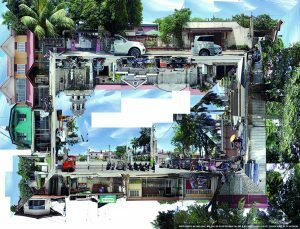 The symposium is part of Mapping Eco Social Assets (MESA)(https://research.reading.ac.uk/urban-living/projects/mesa/) a two year Newton Funded collaborative project between the Schools of Architecture at the University of Reading and Santo Tomas in Manila in the Philippines.